As we discussed in the About Cotton Chapter there are many different types of cotton. After the cotton has been graded and purchased by the factory the bales of cotton are delivered to the Spinning factory. The first step in the Spinning factory is the Ginning. Ginning is the process of taking the raw cotton and cleaning it so that it can be moved further into the Spinning factory to turn into yarn. A cotton gin is a machine that quickly separates the cotton fibers from the seeds.It uses a combination of a wire screen and small wire hooks to pull the cotton through the screen, while brushes continuously remove the loose cotton lint to prevent jams in the Gin. Carding is the processing of brushing fibers to prepare them for spinning. Carding is used to take unordered fibers and prepare them for spinning. It can also be used to create blends of different fibers or different colors. The process of carding mixes up the different fibers, thus creating a homogeneous mix of the various types of fibers, at the same time as it orders them and gets rid of the tangles. 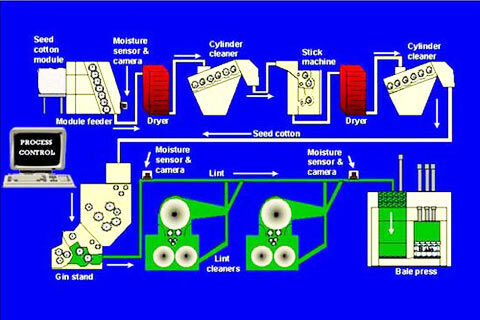 Machine cards for carding cotton also have rollers and systems designed to remove some contaminants from the cotton. The cotton fibers are put almost parallel to each other to become a continuous strand of loose cotton fibers, ready for drawing and twisting. This continous strand is called a sliver. Carding does not take all of the shorter fibers from the sliver; therefore carded cotton is not a soft as combed cotton. Combing is a method for preparing fiber for spinning by use of combs. The combs used, have long metal teeth, and only barely resemble the comb used on hair. However, they are used in a similar fashion with one comb holding the fiber while the other is moved through, slowly transferring the fiber to the moving comb. Combing the fibers removes the short fibers and arranges the fiber in a flat bundle, with all the fibers going the same direction. In general, combing is done with fibers that are longer, and carding with fibers of a shorter length. First the machine separates the short fibers from the long fibers. Second it aligns and straightens the fibers and third it removes any foreign matter and neps (nep is a small knot of entangled fibers which in case of cotton usually comprises of dead or immature cotton hairs) The resulting product is a smoother, more uniform and stronger yarn. For combing, sliver from the carding is passed through Pre-Comber Drawing and then through the Uni Lap to get smaller Laps of cotton. These Laps are then fed to Combers to get sliver which has 14% to 18% of shorter staples removed from the sliver. That 14%-18%% is all shorter fibers that have left the silver leave only longer fibers for spinning and giving combed cotton a softer feel and a slight luster to the cotton than using carding process. Sliver (rhymes with diver) is a long bundle of fiber that is generally used to spin yarn. Carding or combing the fiber, which is then drawn into long strips where the fiber is parallel, creates a sliver. When sliver is drawn further and given a slight twist, it becomes roving. A roving is a long and narrow bundle of fiber. Carding the fiber can create a roving, and it is then drawn into long strips. Because it is carded, the fibers are not parallel, though drawing it into strips may line the fibers up a bit. Because carding has created roving, the fibers are less parallel than top (combed) and are not of uniform length. Carded roving's look fluffier than combed top, which looks smooth and has a high luster. The fiber in combed top tends to be of a fairly uniform length due to the method of preparation. The principal behind open-end spinning is similar to that of a clothes dryer spinning full of sheets. If you could open the door and pull out a bed sheet, it would spin together as you pulled it out. Sliver from the card goes into the rotor, is spun around into yarn and comes out, wrapped up on a package, all ready to go to the next step. This system is much faster than ring spinning with rotor speeds up to 140,000 rpm, and less labor intensive. The disadvantage is mainly that the open end is limited to coarse counts, cloth made from open-end yarn having a 'fuzzier' feel and poorer wear resistance. Combed yarns would not be used in open-end spinning, and generally you can feel the coarseness of the yarns that have been spun open end. This type of spinning is always used in lower priced towels. On each side of the frame are the spindles, above them are the draughting (drafting) rollers and on top is a creel loaded with bobbins of roving. The roving (un spun thread) passed downward from the bobbins to the draughting rollers. Here the back roller steadied the incoming thread, while the front roller, which was moving much faster, pulled thread out (attenuated) forcing the fibres to mesh together. The rollers are individually adjustable, originally by mean of levers and weights. The attenuated roving now passes through a thread guide that is adjusted to be exactly above the spindle. Thread guides are on a thread rail, which allows them to be hinged out of the way for doffing or piecing a broken thread. The attenuated roving passes down to the spindle assembly, where it is threaded though a small ring called the traveler. It is this that gives the ring frame its name. From here it is attached to the existing thread on the spindle. Like the hour and minute hands on a mechanical clock, the traveler, and the spindle share the same axis but travel at different speeds. The spindle travels faster. The bobbin is fixed on the spindle. In a ring frames, the different speed was achieved by drag caused by air resistance and friction. The spindles rotate at 7000 to 8000 rpm, this spins the yarn. The traveler winds the yarn on the bobbin. The ring on the traveler is fixed on a lifting ring rail that guides the thread onto the bobbin in the shape required: i.e. a cop. The lifting must be adjusted for different cotton counts. Ring-spun yarn is a superior cotton yarn that results in a softer, more durable fabric than open-end yarn. The process of ring spinning requires two more processing steps than open-end yarn production and ring-spun yarn takes five times longer to produce. The additional steps involve continuously twisting and narrowing the rope of cotton fibers. This continuous fiber “helix” or twist gives ring-spun yarn extra softness and strength. 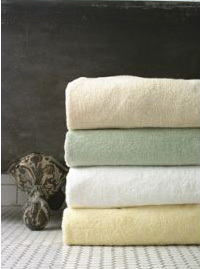 The resulting towels will feel softer wash after wash. 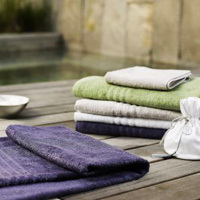 There are some excellent ring spun towels on our More Shopping page. Compact or Condensed Spinning minimizes width and height of the spinning triangle associated with ring spinning. Introduction of this technology began in late 1990s. In compact spinning, the spinning triangle associated with conventional ring spinning is eliminated by air pressure compaction. This happens by suction and compaction on a perforated revolving drum/ apron in the front zone of the drafting system. The process is characterized by the introduction of a fourth nip point down stream of the exit from the conventional 3/3 drafting system, which acts as an aerodynamic condenser. The aerodynamics consideration of the fibers through suction results in narrower spinning zone with individual fibers more effectively bound into the yarn assembly. This offered the potential to create a near perfect yarn structure by applying air suction to condense the fiber stream in the main drafting zone, therefore virtually eliminating the spinning triangle. These Compact Spinning systems offer the possibility of using cotton with short staple lengths to produce high quality yarns that use to required long or extra long staple cottons. Compact spinning technology has potential for improving both the quality and profitability aspects of cotton yarn manufacturing, depending on the objectives of the textile manufacture, different approaches are available. 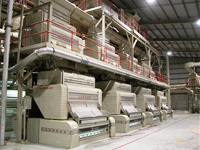 One approach could be to reduce the cost of the raw fiber while maintaining quality. Another could be reducing the twist while using the same raw fiber. Yet another is to eliminate some or all of combing while still producing acceptable yarn quality. Let me make this statement, compact Spinning is usually used for economical reasons. Compact Spinning will allow the factory to make a better yarn from lesser quality cotton. 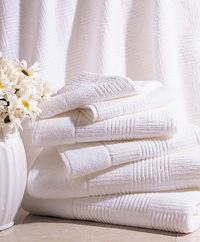 Thus improving the quality of the towel made from lesser quality cotton. It will not give you the same quality as combed yarns. The lower the number the thicker the yarn. So what do the numbers mean? The indirect count numbers are written as two numbers separated by a forward slash, for example 2/30's, this would mean 2 yarns of 30 Ne c plied together. Another example would be 1/16’s this would be a single yarn of 16 Ne c.
For most counts the first number states the number of single ends that have been plied together, so in the case of the example 2/30's count, we are looking at a 2ply yarn made of 30 singles. Our 2/30's yarn would mean that 2 single ends of 30's yarn plied together weigh one pound, to a produce a final yarn of 15's (remember lower number, thicker yarn). DTex is used for very thin threads like machine sewing threads. With these very thin threads a Tex value could be misleading so Tex multiplied by ten. DTex is based on the weight in grams of 10,000 meters of yarn. The direction in which the yarn is spun is called twist. Yarns are characterized as S-twist or Z-twist according to the direction of spinning. Tightness of twist is measured in TPI (twists per inch or turns per inch). Two or more spun yarns may be twisted together or plied to form a thicker yarn. 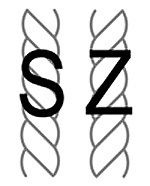 Generally, spinning of single plies are spun with a Z-twist, and plying is done with an S-twist. More on this later. 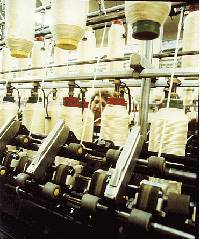 The twist is inserted to the staple yarn to hold the constituent fibres together, thus giving enough strength to the yarn, and also producing a continuous length of yarn. The twist in the yarn has a three-fold effect; first, the twist increases cohesion between the fibres by increasing the lateral pressure in the yarn, thus giving enough strength to the yarn. Second, twist increases the helical angle of fibres and maximizes fibre strength to the yarn. Due to the above effects, as the twist increases, the yarn strength increases up to a certain level, beyond which the increase in twist actually decreases the strength of staple yarn. The continuous filament yarn also requires a small amount of twist in order to avoid the fraying of filaments and to increase abrasion resistance. Yarn is often ply-twisted in a direction opposite to a single yarn twist to improve evenness, strength, elongation, bulkiness, luster and abrasion resistance, and to reduce twist liveliness, hairiness and variation in strength. Third, we need to have the strength and evenness in order to run the yarn through the weaving machine. All these operations take place continuously in a relative order during the spinning process. 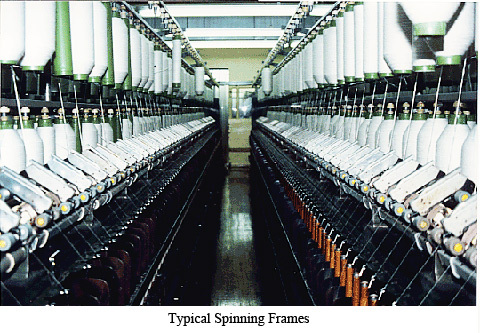 The product of ring spinning is the yarn of given count, twist type (S or Z), draft and (TPI) Twists per Inch. First, let’s talk about structure and define our terms. A singles is, well, a single strand of yarn. At its most technical, some define it as being a yarn which is twisted in only a single direction, so you can technically have yarn composed of multiple strands, but if there’s only one direction of twist it’s still a singles. Plied yarn is one where multiple strands of yarn, each yarn already spun, are put together and twisted in the opposite direction from that in which they were first twisted. A 2-ply yarn has two strands; a 3-ply yarn has three. There are lots and lots of other plying structures, but those are the major ones you will see in towels, singles, 2-ply, and 3-ply. Any time you ply your yarn, you’re making it stronger. This is because twist adds strength; multiple directions of twist add even more strength. You’re also tucking some of the surface of the yarn inside, away from the elements and wear and tear. Plied yarns will always be stronger and sturdier than singles yarns. 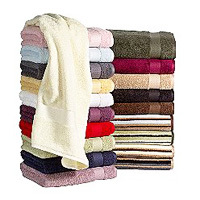 We discuss some excellent 2 ply towels on More Shopping page. You will hear about all kinds of different action that the towel mill can do to the yarns in the spinning process. Regular (if a term could be so described) yarns are twisted to give strength and to allow the looms to weave the towel. But in recent years we have developed other types of twist that will give the yarns more softness and make them more absorbent. De twisting the yarn will open the cotton fibers so that they can trap air and moisture between them, this will increase softness and absorbency. It also will all air to reach the deep inner parts of the yarn and will decrease the time a towel will take to dry after use or after washing. These types of towels are now called various names. The first basic difference between low-twist, zero twist and ringspun cotton is the fibers used to construct both. 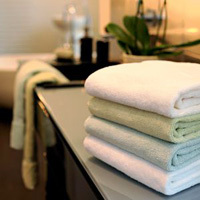 While ringspun towels use a combination of long and short staple cotton fiber, low-twist and zero twist must be constructed only from longer staple cotton yarn. Zero twist must actually be twisted into a yarn and they detwisted and wound with Poly Vinyl Alcohol (PVA) yarn to keep the cotton intact so that it can be woven. The PVA dissolves during dyeing, leaving the extremely low-twist cotton behind. Actually the term zero twist is incorrect, it really has a very low twist. Low twist yarns can be made similar to the above process or by wrapped with a very fine yarn either 80s single or 90s singles so that the yarns can be woven. Low twist yarns have a slightly higher twist per inch than zero twist. 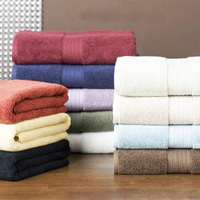 Twisted cotton yarn towels, which have been the norm for decades in the United States, are usually thinner (lower weight) and rougher when compared to low-twist, which has a much better hand and is noticeably fluffier. Twisted yarns does not pill or shed an excessive amount of lint as compared to Zero twist or low twist. 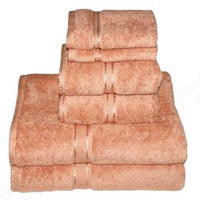 Manufacturers and suppliers of low-twist towels also maintain they are more absorbent than ringspun towels. This seems to be true. 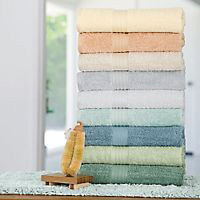 Just to get ahead of ourselves, let us talk briefly about weight, since a Zero Twist or Low Twist towel has cotton in the loops that are of lower twist, the pile yarns are more open and thus they are fluffier. 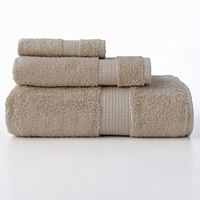 This means they are bulkier than regular twisted towels. 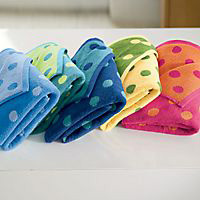 This means that when folded on the shelf in a store they will appear to be thicker and plusher. Both good qualities, but the retailer and the manufacture know this as well, so a Zero Twist towel will be lighter in total weight and in GSM (Grams Per Square Meter, we will discuss this later) than a regular twist towel. Actually the norm is that a Zero Twist will be about 30% lighter that a regular twist and still look the same in terms of bulkiness on the shelve in the stores. This is good for two reasons, one, the cost of a Zero Twist or Low twist is higher because of the better cotton requirements and the extra steps in manufacturing so the lower weight will help offset the additional cost. Second, it is actually enviromentally better because since there is less cotton, less cotton is being used from our enviroment and, as the towels will dry faster in your automatic dryer. Thus saving energy. The only disadvantage to Zero Twist and to a smaller extent to Low twist is the linting issue. Put a Zero Twist in your dryer at home and at the end of the cycle pull out the lent filter. Youwill be surprised at all of the cotton fibersl stuck to the filter. Makes sense, if the cotton fibers are not tightly twisted together, they are not holding each other together and therefore will come out of the towel during wash and drying. Thus a Zero Twist and again to a lesser extent low twist towel will not last as long nor have the strength of a regular twisted towel. We gave up the strength for softness and bulk. 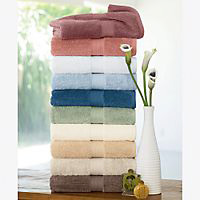 Now of course the retailers test a large majority of the towels that they buy and offer to the consumer. 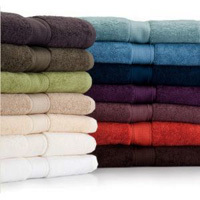 They found this out, yet theyknow you still wanted the softness and the bulk of these towels. So the factories figured out how to put an enzyme treatment in the wash process of the towels that will help the cotton fibers stick together. It really works and most all Zero Twist are treated this way to give you a much better product. Don't let this small problem turn you off to Zero Twist or Low twist (which we discussed can be made without PVA) products. 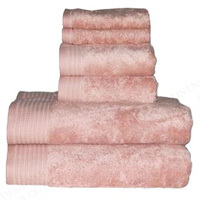 They certainly are usually much softer than regular twisted yarn towels, they feel like a chamois and seem to wick the moisture right off your skin. They are luxurious in feel and appearance. 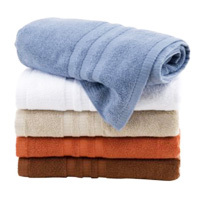 Most people really love these types of towel and once they try it will never go back to a regular twisted towel. 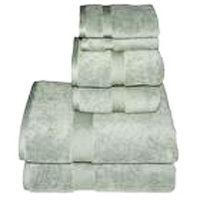 There are some excellent Zero Twist towels on our More Shopping page. 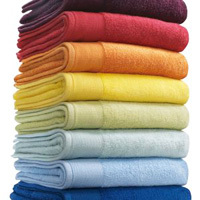 You can however find regular twisted towel in the market that are very close to the softness of Low twist or Zero twist. 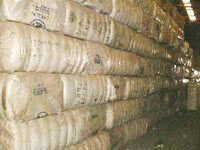 That is because the factory used very high quality yarns made with very high quality cotton to make the yarns. 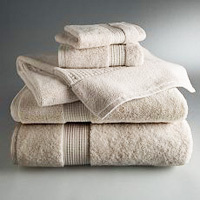 It would also be that the softness came form the use of very fine yarns to make the towel. Most regular twisted towel would use 16 singles and the loop yarn, if you were to use 20 singles the yarn would be finer and thus would feel softer. 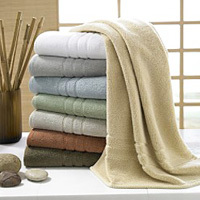 It would be very likely that these types of soft regular twisted towels are made with Supima, Pima, Real Egyptian or another extra long staple cotton and combed as well. 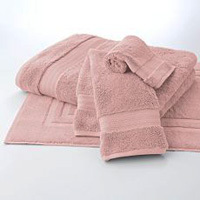 Once the manufactures found how to make towels using PVA and the advantage of the softness the low and Zero twist process added to the towel, they created other concepts for using PVA. Making low twist or Zero Twist towels cost the factory more because of extra steps and the addition of either PVA or a second yarn. Thus they will cost more than a regular twisted yarn towel, plus this is a added value to the product so the factory will make more gross margin on this product. Remember in the Zero Twist we wrapped the PVA around the low twisted cotton, well another option is to wrap the cotton around the PVA, which after washing the PVA out of the yarns after weaving would leave a hollow core inside of the cotton yarn. This hollow core creates an airspace that will improve the absorbency of the towel and add bulk to the appearance. While this may not be a soft as the Zero Twist or Low Twist, if will have similar absorbency factors and bulk while not having the linting issue as bad. It will lint more than a regular twisted towel, but to a much lesser degree than a Zero Twist. 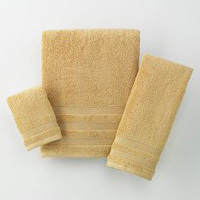 This towel is sold in the market as a "Wrapper yarn", "Hydro Cotton" or "Centrum Cotton" in either case it is a option to the Zero Twist yarns to increase absorbency and decrease linting. Another option is that we can use PVA fibers, and mix them with the cotton fibers and then spinning the yarn. We can then use a regular tight twist to hold the yarns together and after weaving we can wash the PVA fibers out of the towel leaving small air space between the cotton fibers which will have similar absorbency factors as Zero Twist and will have much less linting issues as the cotton was twisted tighter and will hold together better. This towel is sold in the market as "Air Rich" and is an excellent product. If 2-Ply yarn is needed cones from this section are taken to Doublers for Winding Machine that twists two single yarn strands to give 2-Ply yarn on Cones or what we call single packages. Before packing in polyethylene bags, Conditioning is done by storing the single packages in a controlled moisture environment for at least 24 hours. This allows the yarn to absorb moisture to a certain level that is necessary for keeping its strength. Now that you have learned about the workings of the Spinning factory, I suggest that you take a look at this video taken at a Spanish Spinning Mill where you can see all of the actual machines used to take the raw cotton bales from ginning, carding, roving, and spinning to completion of single packages in storage. The narrative is in Spanish so turn down the sound or if you speak spanish you might hear the explaination of the process. 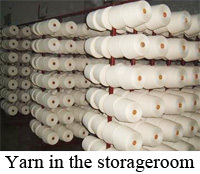 The spinning section for many factories is not owned by the Towel factory but rather is an independent company from which the weaving factory buys its yarns.This Spinning factory sells its yarns to many companies which may include other towel factories as well. 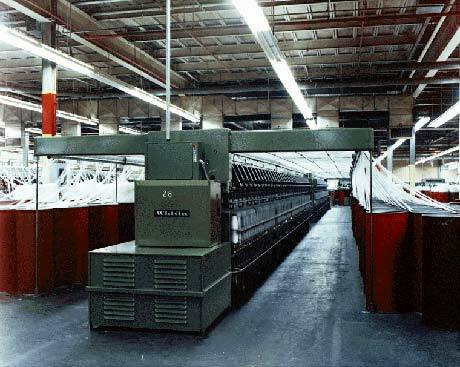 Some factories own their own spinning sections and make yarns not only for themselves but also for other towel factories. These factories we call "Vertical" factories, meaning that they control the entire process from cotton to towel. From here, the yarns to be used for yarn dyed towels are sent to the dyeing section of the factory, the yarns that are going to be used in the process of weaving solid color towels are sent to the warping section of the factory. Let us go to the preparation section of the weaving mill, just click on About Weaving .